Hey gang, guess what today is? That's right: my birthday! But more importantly it's also a DVD release date, and the conflation of the two must mean that this week's DVDs are the best ever, right? Well... meh. 'Dead Man Down' (★) welcomes you into the cinema with Dominic Cooper explicitly stating the entire theme: nobody's meant to be alone and "even the most damaged heart can be mended". It's an unfortunately turgid opening to an occasionally very clever thriller, and throughout it feels as if the overearnest characters hold the movie back. Colin Farrell plays a man who's ingratiated himself into Terrence Howard's criminal organisation to avenge the murder of his wife and daughter. Orchestrating a broad and involute scheme to bring down the organisation and their Albanian contractors, he finds himself having to deal with his neighbour, Noomi Rapace, who blackmails him into killing the man who disfigured her. Because what could be better than a revenge thriller but two revenge thrillers in one! It sounds all very involved, but the two hour runtime allows director Niels Oplev to drip the details in at his leisure and really pore over his pictures. 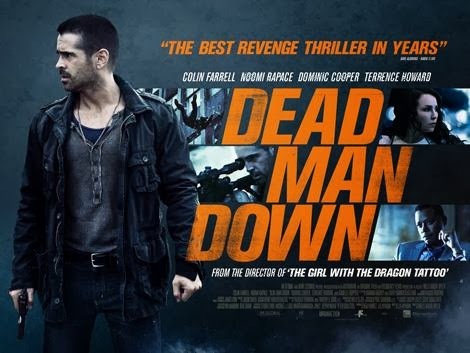 There's a lot of space between the action, so if you can't settle down into sweeping shots of landscape then 'Dead Man Down' may give you problems. It's a decent enough plot, with enough twists and moments of cunning to see you through, but its main failing is that it tries so damn hard. The grittiness is amplified until it becomes just drab and depressing, the tense score ends up sounding like Hitchcock horror music. Like the stating of its theme at the beginning, 'Dead Man Down' can't be faulted for its content, but its insistence on making sure there's no chance you'll miss anything works to its disadvantage. Conversely, French romantic-comedy 'Populaire' (★★) doesn't try hard enough. Set in the 1950s, it sees Déborah François' small-town girl move to a slightly less small town to become a secretary, and Romain Duris as the slumming actor who could do a lot better than this trite movie. He's an insurance salesman who takes her in if she'll agree to compete in the varying stages of the World Speed-Typing Tournament, turning an unengaging romance into an unengaging sports film. Why does he want her to compete in a speed-typing tournament? Good question, and it's implicitly answered with varying reasons of equal irrelevance. Maybe it's because he was so close to being an athlete in his youth, maybe it's because he lost troops in the French Resistance, maybe this whole thing is sponsored by a typewriter manufacturer. One of the problems that sports films face is how to avoid the obvious predictable trajectories. You'd expect a kind of 'Rocky 2' arc, where she has an initial setback which spurs her to greater dedication, then a tear through the various stages leading up to a triumphant final victory and realisation of the personal character arc. And I'm guessing director Régis Roinsard doesn't even see this as a problem because he sure as hell doesn't bother trying to solve it. I don't even consider that a spoiler, because that arc is exactly what everyone is thinking when they watch 'Populaire'. Besides the paint-by-numbers issue, the other problem of sports films is how to avoid lengthy and frequent montages. But this is a concern to which Régis Roinsard has found a very clever solution: he puts you to sleep as early as possible with a flat and indulgent romantic plotline. There's absolutely no reason they shouldn't hook up within the first fifteen minutes of the movie, but the tedious prevarications last for the whole two hours. If you're looking to waste a sixth of your day in tired, frustrating predictability, then 'Populaire' should set you right up. Thank god for 'Byzantium' (★★★★) then, bolting from the blue to save our DVD week. This is Neil Jordan's third crack at a vampire film, after 'High Spirits' which was awful and 'Interview With The Vampire' which was merely vacuous. This time, Jordan takes the route of 'Let The Right One In', which is often wrongly classed as a vampire film with children, whereas it's actually a film about children that happens to include vampires. Similarly, 'Byzantium' is about Saoirse Ronan's stifled teenager pushing out against her mother, played by Gemma Arterton. And they happen to be vampires. Aside from the family dynamic it's also a movie about facing the past, and their two hundred year old conflict with the vampire establishment (yes, I know how ridiculous that sounds) forms the spine of the plot. The collisions of the past with the present take on a physical extension in some really striking scenes of juxtaposition, the elder Ronan observing her younger, human self walking along the beach as a corporeal memory, but the non-linearity is never disorientating. As for the vampire content itself, Jordan cherry-picks the mythological elements he wants to keep, for example including the idea of having to be invited into a house but excluding the power of sunlight, and it doesn't offer anything new. The effects of longevity, isolation, and the mixed blessing of eternal youth have been thoroughly explored before, but this level of humanity from the cast, especially Tom Hollander's brilliant college tutor, at least add new colour. So in conclusion, what should you get me for my birthday? 'Dead Man Down' is two hours of intense frowning. 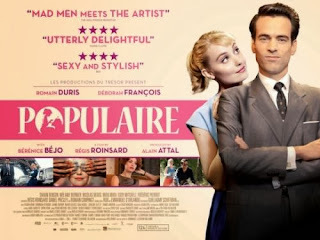 'Populaire' is an unrelentingly boring piece of foam. 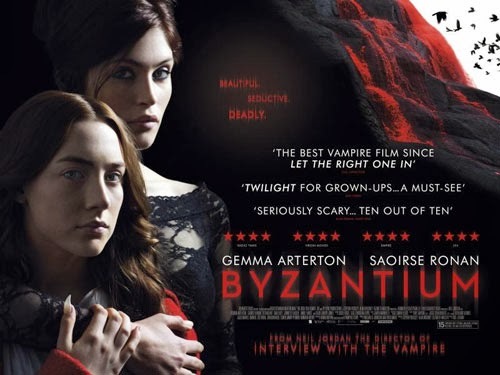 'Byzantium' is both interesting and emotionally warm, but once you've seen it you can move on. ...I guess you'll just have to send me the money? Read previous DVD Digests here. Find more from Maxamillian at Twitter.